Hi! I’m Krystal. I currently work at the Getty Museum in Los Angeles, CA creating metadata for digital images. Most of the images I handle are produced by staff photographers who document the artwork in the museum’s collection. 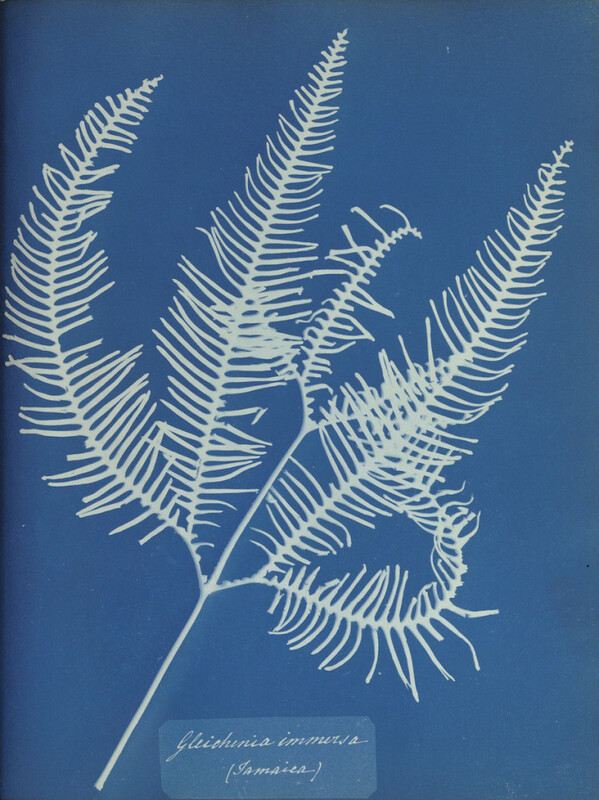 This blue and white botanical image is an Anna Atkins cyanotype that is part of The Getty’s open content program. The Open Content Program allows high resolution downloads for free, unrestricted use of all of our digitized public domain works. Atkins’ scientific illustrations became one of the first books published with photographs. Topics I’m interested in include: image management, metadata, museums, copyright, net neutrality, information literacy, UI/UX, public domain, and open access. I’ve studied and followed these topics for years and pursuing an MLIS was inevitable. I have a BFA in Visual Media/Photography from Rochester Institute of Technology in Rochester, NY. After graduation I interned at the Albright-Knox Gallery in Buffalo, New York for a curator and in then in the Image Resource Center. After 5 years in the snow I moved back to sunny California, where I’m originally from, for an MA in Art Criticism & Theory from Art Center College of Design. Since then, I’ve done media wrangling at a software company, worked as a registrar for private art collections, and managed social media & communications for an arts organization. I’m now in the Collection Information & Access department at the Getty Museum. Digital asset management has been a common thread through out all of these positions. My goal in the SJSU MLIS program is to enhance these experiences with formalized study in information management. On the weekends I like to go hiking with my husband and dog, read, cook, and visit museums. I can also be found on Twitter, Instagram, Tumblr, LinkedIn, and Goodreads. It was great meeting you at the L.A. meet up on 2/4. The cyanotype certainly stood out in my memory and it was nice to connect a real person to the name online. I hope to learn a lot more about digital asset management during my time at SJSU, and your impressive background shows me just how much there is to do. I also appreciated your suggestions for tools and methods for time management that we talked about at the meet up. I’ve already implemented a couple and think they’ll be very useful. Best of luck to you this semester! So good to meet you too! I’m glad I met someone in person on the same timeline as I am, who is also interested in DAMS. Good luck to you too! The Getty is incredible! Your position sounds like my dream job. Thank you for sharing your impressive background.